A Nigerian governor has created a new role for his sister - as commissioner for happiness. Rochas Okorocha unveiled the post during the swearing-in of 27 other new commissioners for Imo State. But his sister Ogechi Ololo later rubbished initial reports stating she would also be in charge of "couples' fulfilment" - saying it was actually "purpose fulfilment". Either way, the announcement has been met with derision on social media. Many questioned the need for such a role, and wondered what it would entail. It also comes hot on the heels of other unusual decisions made by the governor in recent times. 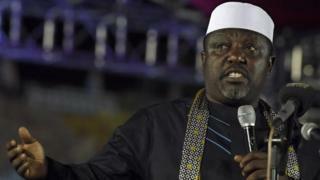 Mr Okorocha raised eyebrows across the continent in October after he unveiled a statue dedicated to South African President Jacob Zuma - a man who has no apparent links to the south-eastern state. But Mrs Ololo - who was previously her brother's chief of staff, as well as being special adviser on domestic matters - assured the BBC it was a vital role which people would understand "with time". "Happiness is something that is still lacking," she said, while acknowledging it could "mean anything to anybody". She added: "My role is to create positive attitudes for our Imo people." Day to day, she explained, the ministry would be ensuring policies designed to make people happy, like free education, were being handled properly and benefiting the community. "This ministry is policy-driven," she said, rejecting suggestions it might be an unnecessary additional layer of government. Can Nigeria's yams power a nation?